We love these traditional hammered glass ornaments. Taking a unique approach to traditional glass ornament designs, these festive ornaments feature a hammered texture and gray gift box. 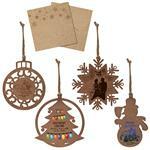 These are available in four shape options: oval, star, circle, or gift tag. 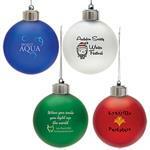 These are a great addition to our promotional ornaments! Dimensions: • Circle: 3" Dia. 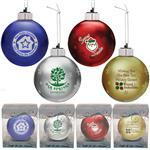 x 1/8"
• Oval: 2 3/8" x 3 1/8" x 1/8"
• Gift Tag: 2 5/16" x 3 1/16" x 1/8"
• Star: 3" x 3" x 1/8"
Typical Imprint Area(s): • Circle: 1 1/2" x 1 1/2"
• Oval: 1 1/4" x 1 1/4"
• Gift Tag: 1 1/2" x 1 1/2"
• Star: 1" x 1"
Available Imprint Options: $40 per color. Full color available with run charge. • Circle: 200 = 26 lbs. • Oval: 200 = 23 lbs. • Gift Tag: 200 = 25 lbs. • Star: 200 = 20 lbs.